It is here. Our favorite week of the year. David and I both take a vacation week and we schedule uninterrupted time together to collaborate and build a sculpture for our sculpture garden. It is a topic of discussion all year as we collect ideas. 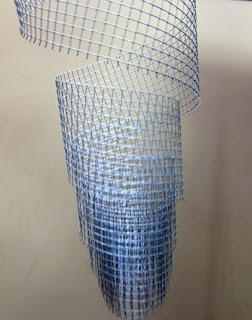 In both 2009 and 2010 we created sculptures using PVC piping. We have a slew of additional ideas in this material but we want a variety in our woods so decided to direct our designs to other materials. We narrowed in on cement - lots of it. This is one load. By the time we finished this project we had gone back to Lowe's 4 times. Grand total - 19 bags of Quickrete Fast Drying Cement. Did you read my posts on balls? I have a growing collections of spheres and have limited room left for them inside. It is time to expand into the great outdoors with the eclectic collection and we decided to use our Sculpture Week to add to it. 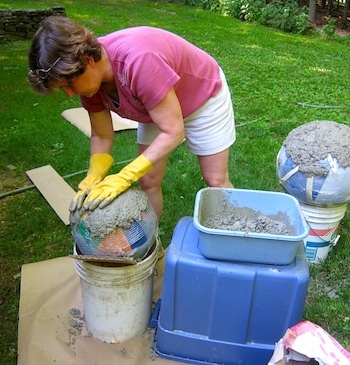 Our thought was to create a series of cement spheres so we started with a google search and I found this site- The Artistic Gardener, which gave a little guidance. We decided to work with a beach ball beginning, covered in an armature of hardware cloth, then covered in cement. We had lots of unknowns beginning. Part of the joy of our Sculpture Week is the experimentation and the learning as we go. The first quest was for beach balls in a variety of sizes. Amazon is our go to shopping source and they did not disappoint. 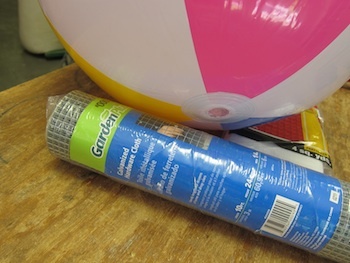 We ordered beach balls in 16', 24' and 48" diameter. We really wanted a 36" as well but couldn't find one. In the end, the 48" ball is really only 36" which worked. But now we could use a 30" as well. But did you know you can get a beach ball 10 feet in diameter? We didn't think that was the place to start experimenting. We purchase hardware cloth in the gardening section of Lowe's. 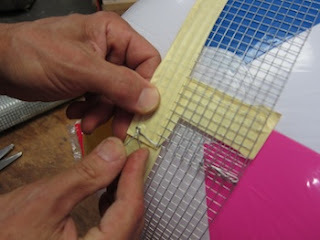 We started with 1/4" mesh but learned that 1/2" was better for this project. We cut it into strips about 3" wide. The edges were predictably sharp so we experimented with taping the edges using plain old masking tape. At first we taped one side, then none, and then both. Taping both edges worked best. The others tended to pop to beach ball. We wired the ends together. We tried staples and taping but short wire was the quickest. We also learned not to make the strips too tight. It helped in applying the concrete if they were lose so you could force some concrete into the mesh. And here we go. We learned to just add water slowly. Cement goes from the wrong proportions to the right one fairly quickly. We started with small batches in an old dish tub but moved to bigger batches as we gained confidence in the process. On day one we applied the concrete right to the wrapped ball trying to get it to stick. 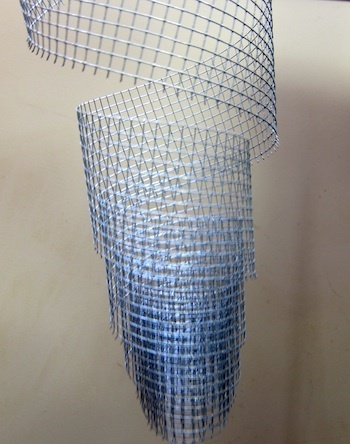 Because the wire mesh was too small we had trouble but solved the problem by working in small areas. At the end of day one, as we left the balls to start curing we thought about modifications. Return tomorrow for more on the creation of cement spheres. Walmart had beach balls for 3 bucks all summer and I bought a few exercise balls at garage sales. 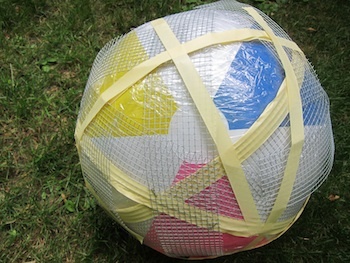 I cover mine with drywall tape, so I have no problem with risking popping the ball. I first cover one half let it dry and then cover the second half. And then the whole ball again before I mosaic them .